Missed our webinar on donation matching, #GivingTuesday, and follow-up year-end planning by our Director of Business Development Tim Sarrantonio and NeonOne partner consultant, Adam Weiger of Double the Donation? Not to worry. Check out the recording of the webinar below. You can also download the slides from Neon and Double the Donation and find more resources at our support center, here. If you’re otherwise pressed for time, the following is a summary of the key things presented in the webinar. Why should you consider #GivingTuesday? It’s a global movement with wide-range awareness opportunities for any organization. The branding for it is ready and free. The #GivingTuesday twitter account is fairly good with retweeting nonprofit campaigns and has a massive follower base. It can act as both a megaphone and a bridge to an active community of supporters. It’s really easy to join in as all it really involves is active use of the hashtag on various platforms and engaging with audiences. It also falls in a high-volume period of giving and is a kick-off point for the giving season in earnest. Why might it not be right for you? While it has become global, it isn’t necessarily universal. It may not be widespread enough for some to reach particular audiences. Nonetheless, the scale of the campaign is quite large and it can be very easy to get lost in the noise of all the other nonprofits across the world making their cases. So, it is not a guaranteed boost. Frankly, it is in many ways more work as it becomes another appeal to do and manage. Strategizing is necessary to make it work to your benefit. Your organization must commit to making the event fun and effective, as well as build context around your campaign and your organization’s efforts. There is also the possibility of donor fatigue or a drop in donor willingness from an overwhelming volume of appeals. According to Double the Donation, 65% of Fortune 500 companies have donation matching programs where they match employee donations to a wide range of nonprofits. These corporate philanthropy programs are often year-round. They are designed to support nonprofits that employees are passionate about rather than board members or executives coming up with nonprofits to support. The first gift-matching company was General Electric in 1954 and has since donated over $1.3 billion. $38 million dollars were matched just last year. Generally, programs have generous grace periods, usually a couple months to submit the matches. Nonprofits should try to follow up with donors immediately upon receiving gifts so that the matches get submitted! Matching gifts are massively underutilized! Multiple billions of dollars go unclaimed. Either due to a lack of awareness or knowledge or even simple forgetfulness, up to 10 billion in potential nonprofit funds are left unmatched. Nonprofits should be proactive in getting match requests submitted. State Street was the first to expand its gift-matching policy to all global employees. It even matches fundraising efforts, meaning it will match not only what employees donate but what they raise such as through peer-t0-peer campaigns. Stop doing appeals. Appeals are in a vacuum. When you do an appeal, the problem is that it’s not in a larger strategy of philanthropy and stewardship. Start doing philanthropy. Practice a donor-centric model of engagement. Use things like donation-matching to connect donors to your nonprofit. In the end-of-year period of high-density giving, conduct retention-focused fundraising. For Neon users, take advantage of the new dashboard where you can view key retention metrics through the fundraising KPIs and other data visualization widgets for assessing your retention success. Consider the following steps to maximize fundraising at the end of the year. Review previous campaigns and events. What is realistic for you? What worked, what didn’t? Analyze your fiscal situation. Use reports to gauge what is feasible for your organization. For instance, #GivingTuesday may not be realistic or efficient for your organization. Analyze strategic goals progress and operations. Set goals for your retention campaign such as fundraising targets, branding or reach objectives. Philanthropic fundraising is important to any organization, regardless of size or budget. Segment your audience. Identify specific targets and VIP prospects. Want to learn more? 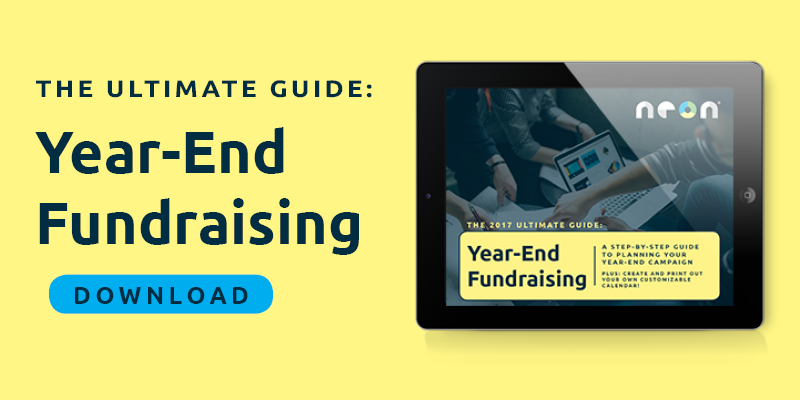 Check out Neon’s popular Year-End Fundraising Guide, which elaborates on the steps above and comes with a helpful printable calendar with key checkpoints to consider. #Giving Tuesday can be great but it’s not necessarily for everyone. See if it is realistic for you! Retention is incredibly important. Build a strategy to bolster it. Don’t stop at #GivingTuesday. The following days and weeks are very important to fundraising success. For the rest of the webinar and its Q&A portion, check out the full webinar! Keep on the lookout for more webinars at NeonCRM. Louis is a digital marketing intern at Neon. He studies Journalism and Business Institutions at Northwestern University. He is interested in incorporating technology, design and storytelling to solve problems, empower communities and enrich organizations.